Ideal for electronic and business machines, display stands and racks and other applications needing a high capacity, low height caster. Foot-operated lever simultaneously locks wheel and swivel. Castered equipment held firmly in place. Upward pressure on lever releases brakes. Two independent rows of hardened, polished ball bearings roll freely in lubricated raceways. 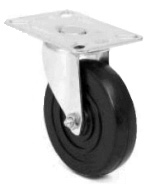 Total lock swivel caster is ideal for institutional racks, laundry trucks, packaging, equipment and more, locks both wheel and swivel. Brake lever is easy to access and operate.